In 2018, Governor Tom Wolf signed HB 271, which officially legalized sports gambling in Pennsylvania through an extensive bill passed by the Pennsylvania General Assembly. The legislation is only one part of a broader revenue package intended to solve Pennsylvania’s $2.2 billion budget deficit. Since 1992, the Professional and Amateur Sports Protection Act (“PASPA”) banned all sports betting in most of the United States. Thus, for more than 25 years, this federal ban on sports wagering meant that the sports betting industry was more or less relegated to the State of Nevada. This changed last May when the U.S. Supreme Court decided Murphy v. NCAA, No. 16-476, 584 U.S. ___ (2018) held that PASPA was unconstitutional. The Murphy case resulted in the complete negation of PASPA, allowing the states to self-regulate, at least until Congress passes a new Federal law. This decision’s historic significance is that it immediately and effectively granted individual states the power to legalize sports betting. Pennsylvania was the fourth state to legalize online gambling in the United States, behind Nevada, Delaware and New Jersey. Since then, Mississippi, New Mexico, Rhode Island, and West Virginia have followed suit with all of the other states intently and closely watching the early returns. Onsite locations are active in Pennsylvania on both sides of the state, with online options coming later in 2019. The Sportsbook at Hollywood Casino Penn National was the first retail sportsbook to open in the Commonwealth, opening on November 17, 2018. 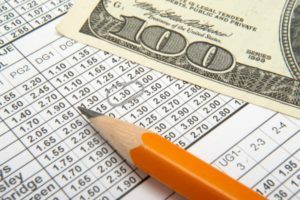 The legalization of sports gambling was the result of years of efforts by Commonwealth lawmakers who have advocated for regulated gaming as a potential continuous and regular source of substantial revenue. In total, sportsbooks will be returning over 40% of their profits! Also, professional sports leagues are requesting “integrity fees” up to 1% of sportsbook operators’ gross handle. These fees may equal to as much as 20% of revenue, significantly reducing profitability. Powell Law recognizes that having a tremendous support staff is as important as having outstanding attorneys. Our always friendly and helpful staff will efficiently handle all tasks and clearly answer all questions that are important and specific to a client’s particular case. Powell Law’s unsurpassed qualifications make it an obvious choice for representation in personal injury cases in the Scranton/Wilkes-Barre area. Contact Powell Law at call (570) 961-0777. The consultation is FREE.